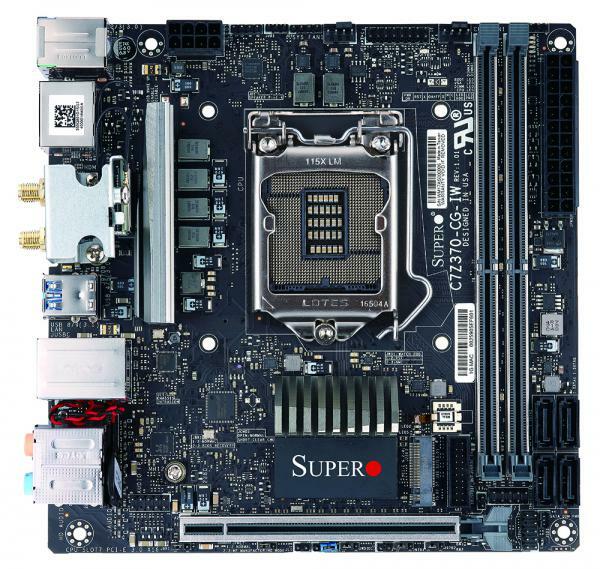 Today we get an opportunity to look at a board from Supermicro's consumer segment, SuperO. We will look at a Mini-ITX board designed for gaming in the SuperO C7Z370-CW-IW. This diminutive board includes Wi-Fi capabilities, USB 3.1 ports, dual M.2 slots, as well as RGB LED features we are used to seeing in a board designed for gaming, all in a Mini-ITX sized package. The board we have today is pegged to be a gaming motherboard and is of Mini-ITX size. Though just because it is small, not much is missing - the C7Z370-CG-IW includes both wired and wireless LAN (Intel and Realtek driven respectively), dual M.2 slots, four SATA ports, and a VRM capable of handling the CPU both stock and overclocked. With a lack of real estate compared to MicroATX or ATX boards, about the only thing missing here is the ability to SLI or Crossfire (only one PCIe slot), as well as the maximum amount of DRAM is 32GB since there are only two slots. Outside of that, there isn't much missing and the C7Z370-CG-IW comes across as a well-rounded board, especially for its size. We don't expect to hear the term gaming associated with SuperMicro much as they stick to server boards for the most part. SuperO on the other hand (think of it like AORUS is to GIGABYTE) brings to the table whole systems, chassis, and motherboards which they say has server DNA under the surface but gaming features on the outside. SuperO has been a presence in the market since the Z87 chipset hit the scene a few years back. Since that time, they have brought out more motherboards in three different classes - Core Business (designed for high uptime), Core Gaming (focuses on essentials for professionals, gamers seeking a well-round option), and Professional Gaming (flagships of the SuperO line, latest features and performance) and have a seemingly well balanced set of SKUs covering multiple use scenarios. SuperO is hoping the trust they built in the server space continues to translate over to the consumer side as their board certification process is similar to what is used on the server level boards. One of the recommendations we would put to the SuperO team is to have an easier naming system! For the Z370 chipset, SuperO currently has two motherboards available, a full sized (ATX) C7Z370-CG-L, and the C7Z370-CG-IW we have for review here. The 200-series platform has a total of eight boards varying from the B250 and H270, up to the Z270 chipsets. I would gather as time goes on we will see more offerings covering their Professional Gaming and Core Business segments. For this review, we will be working with the only Mini-ITX board they have released in the C7Z370-CG-IW. In our performance numbers, it is worth noting that in our shipping BIOS came an odd set of default parameters. The motherboard TDP limit was defaulting to 65W, perhaps because this is what the system engineers think is the suitable limit for a board of this size. No other manufacturer does this - if they have a smaller system that has a peak TDP, then this is listed in CPU support, not forced through default BIOS options. As a result, should any user want a 65W+ CPU in this board, then BIOS adjustments will have to be made. The benchmark numbers when the TDP limit was lifted were as expected. Power consumption at idle for a smaller sized motherbroard was lower than the larger systems, however second-tier motherboard manufacturers often fail at metrics like POST time, and the CG-IW here takes around 10 seconds longer to POST than other Z370 boards from top-tier vendors. For most of the rest of the throughput benchmarks, the system was in the often within a percentage point of the top performing system, albeit in the bottom half of the stack. Our overclocking results were a bit disappointing. In fact, due to the 65W imposed BIOS limit at stock speeds, during any testing that included AVX (Prime95, POVRay, and Blender) we saw power limit throttling which resulted in lower scoring benchmarks. Once the power limit was raised, the results were right in line with the rest of the data sets we have, except in peak frequency. Auto overclocking didn't yield much as it raised the voltage too high almost immediately, causing current limits to be hit. Manual overclocking wasn't terribly fruitful either. We were able to push all core clocks to 4.4 GHz on this board, whereas the other Z370 boards tested happily ran up to 5 GHz. The issue here according to Intel XTU was Current Limit Throttling. The problem is the board doesn't appear to have settings for current we can raise to get around it. If pushing heavy overclocks is your thing, you will have to look at other boards (ASUS ROG Strix Z370I Gaming for example). On the memory side, the board is only rated to DDR4-2666, however our DDR-3200 kit ran when XMP was applied. For connectivity, the C7Z370-CG-IW has one full-length PCIe slot, connected via CPU, and no others on the board. The back panel I/O has a legacy PS/2 port, four USB 3.0 ports, a DisplayPort 1.2 port, an HDMI 2.0 port, the Realtek Wi-Fi card, an Intel I219-V port, two USB 3.1 ports, and the 7.1 channel audio stack. The number of USB ports available on the back may be a bit light for some. This is due in part to the orientation of the Wi-Fi antenna leads are oriented horizontally instead of vertical which would allow another stack on the back. The HDMI 2.0 is enabled by an LSPCon. Pricing on the C7Z370-CG-IW comes in at $191 on Newegg. 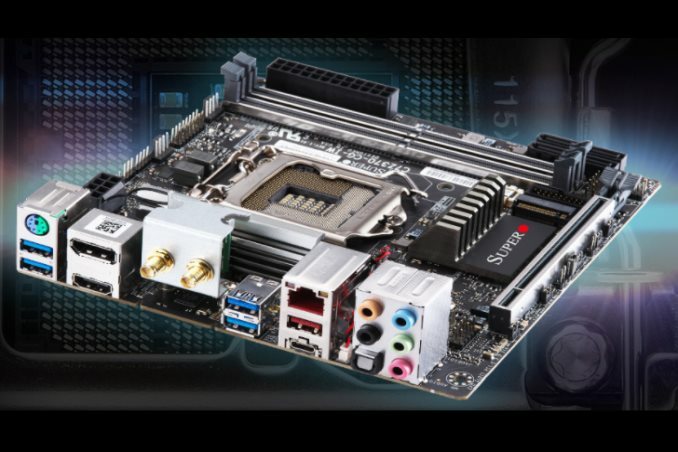 By form factor, the SuperO Mini-ITX board will compete with the likes of the ASUS ROG Strix Z370I-Gaming at $179 and MSI Z370I Gaming Pro Carbon AC also at $179. GIGABYTE also throws its hat into the Mini-ITX ring with its Z370N WiFi priced at $160 while ASRock has the Fatal1ty Z370 Gaming-ITX/ac sitting at $180. Prices are all within a stones throw of each other and most have similar features - the differences are to be found in the fine details such as front panel USB 3.1 support, USB ports, fan headers, or the options in the BIOS which can allow the boards to reach peak overclock. I don't have any direct experience with this model, but I have used their previous generation RTL-8821AE which is a 1T1R wireless-AC card. It came with a mini-ITX H97 board I bought for home theater use. For Wi-Fi only duties the card performs fine, but the link rate is limited to 433Mbps due to the single stream nature of the card. With good signal I got almost exactly half the sustained transfer rates as with a 2 stream Intel 7260 or with the 2 stream Broadcom BCM94352. So in that regard performance seemed to be pretty good, matching what was expected based on the specs. That said, I definitely saw some strange behavior when I tried to use Wi-Fi and Bluetooth simultaneously (playing audio to a BT speaker while watching streaming video online). Either the audio would have frequent dropouts OR the data stream would be interrupted, causing buffering. My guess would be that, despite having both 2.4GHz and 5GHz capability, they only had 1 full transmit/receive chain and that the radio was having to cycle back and forth between the two to maintain both the wireless AC and Bluetooth. I worked around it by using a USB Bluetooth dongle I had on-hand until I was able to replace the card. 2. The card is mini-PCI-E, not USB. It has all the features compared to other flagship boards except for Thunderbolt port I believe which if I am correct not many people use or need but other boards also do have their share of omissions.